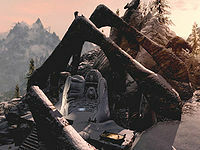 Volskygge is a Nordic barrow west of Solitude in the coastal mountains, situated between Deepwood Redoubt and Lost Echo Cave. The barrow contains a word wall for the Whirlwind Sprint shout, guarded by the dragon priest Volsung. The barrow has two interior zones, namely Volskygge and Volskygge Passages, which are separated by a puzzle. The second zone leads to an exterior area, Volskygge Peak, which contains the word wall. The barrow has numerous burial urns and urns throughout each of the zones. There are three bandits near the entrance, two of which are melee fighters, while the third is an archer. As you approach there is a long flight of stairs leading down to a pressure plate at the bottom which triggers a battering ram from a doorway on the left. Through the doorway is a room with two upright sarcophagi against the rear wall. The one on the right is already open and has a dead draugr lying on the ground in front, but the one on the left conceals a slumbering leveled draugr. Between the sarcophagi is a doorway that is completely blocked by rubble. At either end of the room are stone tables; the one to the east has four burial urns on top and the other is broken with a single burial urn among the remains. Stairs lead back up to ground level past the pressure plate outside. There are stairs leading up to walls with a walkway linking them in front of the entrance. On a raised section to the left is a campfire with a charred skeever cooking over it and a wooden table nearby with a skeever tail and iron dagger on top. The entrance is an iron door under a covered area. The fast travel point will take you to a point a few paces in front of a stone hut to the north of the entrance, with a sunken path to the right of this that takes you to a round-topped barrow with a circular passage around a central chamber that has an adept-trapped iron door. Beyond the door is the circular chamber with two sideboards to the left as you enter. The first has two burial urns on top while the second is broken. Beside this is one of two large urns flanking an altar with some skeletal remains on top. Further to the right is a set of shelves holding two random potions of healing. The entrance leads into an antechamber with stone benches along both side walls and another iron door ahead. This door leads into a large chamber with banners on posts flanking a short flight of stairs leading up to a raised platform with a throne at the top. This is across in front of you as you enter. In front of the throne is a pressure plate that triggers poison darts. To the west is a wide passage that descends to the north. Two bandits will emerge from this passage. There are roots descending from the ceiling and covering the floor of this passage, which turns west at the end. Ahead there are blood splatters on the floor. Just after these is a pressure plate that triggers a spike wall. Once past this there are stairs leading down to an apprentice-locked chest at the bottom, guarded by a leveled bandit. At this point the passage turns north descending further. At the bottom is a T-junction with a doorway on the left and the passage continuing to the right. The room contains two leveled bandits hidden by a stone pillar. Against the west wall is a set of shelves holding a random potion of healing and a copy of the Lockpicking skill book Surfeit of Thieves. To the left is a concealed door that is opened using a lever locked behind an adept-locked cage on the left. The door opens to reveal a tunnel descending to a small room containing an unlocked chest and a sideboard with two random potions of magicka on top. The passage heads down, passing a set of shelves set back against the wall on the right, with three random potions of health atop them. Beyond is an entrance into a large banqueting hall. There are a couple of dead draugr in the hall and two doorways to the north. These lead into a narrow horseshoe-shaped corridor with a room immediately on the left and a leveled bandit patrolling between this and a second room further along. In the second room is another bandit who will be alerted by any fighting and converge on you. The first room contains several sets of shelves holding ancient crockery and a few large urns. The second room has two doorways leading into it and contains more shelves of crockery and a central stone table and benches with two potions of minor healing on top. Continuing along the narrow corridor there is a third room containing nothing much of interest. Back in the banqueting hall, there are sets of shelves along the north wall mainly filled with more clutter, two random potions of healing, and a random potion of health. Down the center of the room is a very long stone table with stone benches on either side and a throne at the far end. There is the body of a draugr on the floor and another lying across part of the table. At the far end of the room is an iron door. In the middle of the doorway is a pressure plate that triggers a battering ram with a dead bandit lying beyond it. There are large urns along the corridor beyond, which then turns north. Ahead is a chamber containing four upright sarcophagi in a square in the middle of the room with a doorway to the north blocked by a lowered gate. In each of the corners of the room are raised sections with plinths holding handles and symbols of one of four animals beneath them. In front of the exit is a fifth plinth with a copy of The Four Totems of Volskygge on top. This book contains a riddle for the solution to raise the gate. The four handles must be operated in the correct order to raise the gate, which is Snake—Bear—Fox—Wolf. A fire will light up atop the central pillar each time you pull the correct handle. Three of the upright sarcophagi contain slumbering draugr. The room beyond the gate contains a central stairwell that descends to a passage heading west to an iron door to Volskygge Passages. There is also an unlocked chest at the back of the room and a skeleton to the left, in front of another hidden door. The lever to open it is to the left. The door opens to reveal another tunnel descending to a small room with a pressure plate in front that triggers a poison dart trap, while the room contains a sideboard with a random potion of stamina and two random potions of resist cold on top and a large urn opposite. This area contains several leveled draugr. It starts with a wide passage descending stairs heading west. At the bottom it turns north and passes four statues before reaching an open door into a chamber with several large urns around the sides, an iron door opposite, and a random empty soul gem on a stand. Beside this is a lever that raises a gate to a tiny alcove that is empty. 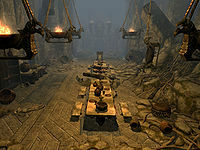 Through the iron door is a room containing a magic-using draugr standing near an altar on a raised section with a skeever tail and two empty petty soul gems on stands, while flanking the altar are two urns and in the northeast corner is an apprentice-trapped chest. To the west is a doorway blocked by a gate; the lever to operate it is to the right. Through the doorway is a small room with a large trapdoor in the floor with sharp stakes beneath it. There are two urns and two burial urns in the room and a doorway to the west. Between the trapdoor and doorway is a pressure plate that triggers a swinging blade trap in the next doorway. The next room looks similar to the last with a large trapdoor in the floor, however beneath this one are small wooden sections and stakes beneath these. In the northwestern corner is a doorway and in the north wall is a concealed door with a dead bandit in front under the lever that opens it, while to the right are two more urns. Behind the hidden door is a second with the lever on the right. Activating this one opens the second and closes the first. This opens into a room with some grating on the floor, two urns and an adept-locked chest at the rear and a weight sensitive plinth in the center with a leveled potion of healing on top. Taking the potion triggers spears to come up from the floor through the grating. The doorway in the northwestern corner enters a catacomb area, where there are several dead draugr and slumbering draugr in alcoves as you descend. There is a pressure plate at a crossroads that triggers a spike wall. To the east at this point is a narrow flight of stairs descending and passing through a small catacomb with a single draugr patrolling. At the end are the sharpened stakes underneath the second trapdoor. There is a dead bandit lying among the stakes. Climbing back to the crossroads and heading south leads to an apprentice-locked chest where the passage turns west. At the end, turn north and descend to another area with even more leveled draugr in alcoves. There is a central area with many roots descending from the ceiling and pathways to either side. 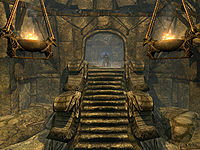 Opposite are stairs leading back up a long flight of stairs to the north with a leveled draugr patrolling at the top. Ahead is a room patrolled by another leveled draugr and containing an altar on a raised section opposite the door with three random potions of health and an open sarcophagus at either end. To the west is another long flight of stairs with a pressure plate near the top that triggers a battering ram. The passage enters a natural cave system with cobwebs everywhere, and the passage winds as it continues to rise. There are a number of frostbite spiders in this area as well as several web sacs and dessicated corpses that can be looted. Eventually the passage opens out into a narrow cave with several levels above you and many more spiders and egg sacs. Keep following the passage as it twists and turns, passing thick cobwebs you have to burn or chop your way through, until you reach a brightly lit cavern with waterfalls dropping from above. Three frostbite spiders will descend from above. At the far end, break through more cobwebs and follow the passage as it rises to the east. Shortly after the passage reenters the barrow and after climbing a flight of stairs you will find an adept-trapped chest. The passage turns south and descends to a large chamber with three bridges, one of which is broken crossing a fast moving stream. There are two draugr patrolling backwards and forwards across the bridges and a third standing at the top of stairs to the rear. Downstream is an unlocked chest and a pickaxe on the ground next to an orichalcum ore vein. Across a bridge and up the stairs, there is a second flight a short distance behind flanked by statues leading up to a small room with a Draugr Death Overlord sitting on a throne opposite, who will arise when you enter. There is a sideboard in the northwestern corner with three leveled potions: one of health, one of healing, and one of magicka. 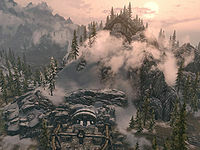 In the southwestern corner is an unlocked boss-leveled chest and in the southeastern corner is a set of shelves holding an ancient Nord bow and quiver of arrows, a medium coin purse, and eight loose coins. Behind the throne to the east is a narrow flight of stairs leading up to an iron door and the exit to Volskygge Peak. Once you exit the Volskygge Passages, you find yourself atop a nearby mountain, at the base of a staircase. At the top of the staircase is a word wall that teaches part of the Whirlwind Sprint dragon shout. Once you have learned the word, the sarcophagus at the top of the stairs will open, and the dragon priest Volsung will emerge. He is a powerful undead foe who uses strong frost magic and carries the dragon priest mask Volsung. It's possible to reach both Volsung and the word wall by just running up the mountain. Volsung will rise from his grave after learning the word from the wall. You can then go through the dungeon starting with the exit until almost the very start of the second section, where a door that only opens from one side stops you from continuing (right after the trapdoor rooms). It is possible to crouch and hit the lever on the other side of the gate, causing it to open and thereby complete the entire zone in reverse. A follower may not appear if you enter the ruins though the reverse way but will be stuck on the other side of that gate. Scaling the peak to reach the word wall (versus going through the ruins themselves) has caused confusion about the puzzle room. Going back through and trying to solve the puzzles, they are backwards from coming the wrong way. The easy way to avoid this is to simply go through the ruins and solve the puzzle as you go along. You may want to do the puzzle room wrong to start with. There are three draugr and a dead skeleton with loose armor and weapons. Alternatively casting a rune spell next to one of the sarcophagi will cause them to burst open. If you have completed the puzzle but fast-traveled from the mountains without killing Volsung, the puzzle gate may be closed with the handles locked in place when you return, preventing you from reaching the summit. This page was last modified on 26 May 2018, at 14:52.